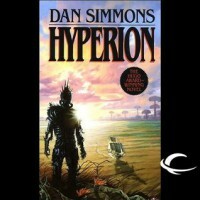 I first read Hyperion back when I was in high school and I always meant to go back since it definitely ends on a cliffhanger. At this point I knew I would have to reread it since I only vaguely remembered the storylines. It's still a fantastic book that is set up like a sci-fi Canterbury tales. Seven pilgrims have been chosen to travel to the planet Hyperion, where the mysterious time tombs are set to open soon. Each pilgrim takes a turn to tell their story of their connection with the planet and why they wanted to travel there. Sol Weintraub's story was my favorite then and it still is today. He is the only one of the seven who had never travelled there before. His daughter had been investigating the tombs and had been affected by a mysterious illness that causes her to age backwards, losing a day each time. One story I didn't remember much of was Martin Silenus's, the poet and his thoughts and dealings with publishing. Especially compared with how publishing is now. I wasn't big on the audiobook. It does work, but there were four male voices and one female. When the person was narrating their story, it would be completely narrated by that person. So the only time you had the female narrator talk (other than the parts between stories) was in her story. But it's a great story and a classic. I will actually read the followup this time.